When Universal Pictures reached an agreement with the Wisconsin Department of Commerce to produce "Public Enemies," the Johnny Depp film about 1930s gangster John Dillinger, the film makers and their supporters were ecstatic. They projected the production would spend up to $20 million in the state while receiving tax breaks worth only $3.9 million. Quite a deal. But when the "Public Enemies" production packed its bags last year, state taxpayers gave the movie company back almost every penny it had invested in Wisconsin. The Wisconsin Department of Commerce reports that film makers spent only $5 million, 25% of the promised investment, but were paid $4.6 million in incentives, $700,000 more than projected. $2.7 million was spent on the salaries of non-Wisconsin residents who worked on the film - almost twice what was paid in salaries to Wisconsin residents employed by the production. At a time when tens of thousands of Wisconsin workers are losing their jobs and the state is struggling with a $5.7 billion deficit, taxpayers covered $450,000 of director Michael Mann's $1.8 million salary. They weren't on the hook for the stars' salaries only because they are not eligible for the tax credit program. But those who provide services including hair and makeup to the stars were included. And all of those working for Depp were brought in from out of state. This program is a boondoggle. It creates few jobs, doesn't generate revenue and has a very small multiplier effect. Governor Doyle who says the credits cost too much and don't create permanent jobs has proposed eliminating the program. Wisconsin's budget is riddled with tax expenditures like this one that fail to deliver promised jobs and economic activity, but contribute to the state's $5.7 billion budget deficit. Legislators should support Governor Doyle effort to eliminate this program. Wisconsin's experience is not unique. Forty states now offer to pay 25 percent to 40 percent of film production costs. Taxpayers around the country are reimbursing producers for everything from crewmember meals to movie-star salaries. But there is little evidence that such handouts are fiscally sound. One of the best studies on film industry tax breaks comes from Louisiana's Legislative Fiscal Office. Louisiana experienced an explosion of film production after enacting a tax credit in 2002—from around $20 million a year to the present $350 million. But Louisiana recovered just 18 percent of $121 million in film credits awarded in 2006. As for the jobs, the report projected that Louisiana's tax credit would generate, at most, around 3,000 jobs and said the economic impact outside the film industry was "likely to be modest." For every dollar of revenue lost to the tax credit, only 15 to 20 cents was recovered in associated business. With its 25 percent subsidy on in-state production expenses, Massachusetts experienced significant leakage as much of the money it paid went for the salaries of out-of-state movie stars, who spent very little in Massachusetts. The Massachusetts Budget and Policy Center recently reported that the film subsidy rate is five times higher than what the state offers for developments in blighted areas. Even more troubling, a report by the New Haven-based think tank Connecticut Voices for Children projects that Connecticut's tax credits would reduce the state's revenues by $118 million in fiscal year 2009. Rhode Island, Michigan and Louisiana have all made moves to rein in overly generous subsidies, concluding they have not delivered all the promised jobs and revenues. Competition between states to attract film companies generates a race to the bottom as states offer larger and larger incentives to lure film producers. The United States has become in the words of the Incentives Office, a consulting firm in Santa Monica, Calif., the New Bulgaria, a reference to what was once the film industry’s favorite low-cost production site. The movie houses make out like John Dellinger, but taxpayers are left holding the bag. Ultimately, the main beneficiaries are not taxpayers but lawmakers. Every incentive package ...allows lawmakers to make public announcements taking credit for "new jobs." Location-based incentives can therefore be thought of as a market transaction between lawmakers and film companies. Lawmakers purchase favorable media coverage for themselves, film companies accept payment for filming in economically unprofitable places, and taxpayers finance the deal. It's hard to see how that's good policy. The glamour of movie-making may be hard for policymakers to resist, but they could better serve their constituents by simply watching a movie at the local movie theater and leaving Hollywood in California. On Tuesday, February 24, Milwaukee Congresswoman Gwen Moore endorsed Milwaukee Public School (MPS) Board President Peter Blewett in his campaign for re-election in the 6th District. Moore cited Blewett’s record of inclusive leadership and achievement in her endorsement. Moore, a former state Senator, praised Blewett’s efforts to secure property tax relief and noted that the Governor’s budget includes changes in funding for the Milwaukee Choice program that will return millions of Milwaukee taxpayer dollars to the city’s public schools. “Peter has long been an advocate for changes in the funding formula, and his hard work will hopefully pay off soon,” she said. Peter Blewett represents Milwaukee’s 6th District. He was first elected in 2000 and has served two one year terms as the board president. He is a UWM faculty member and the parent of MPS student who attends the Milwaukee School of Languages. 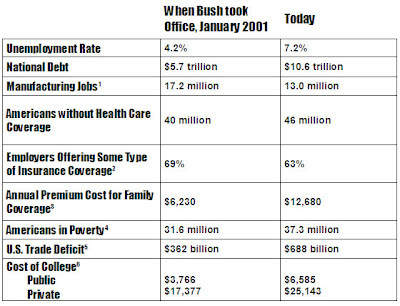 The election is on April 7, 2009. The Mayor of Lansing, Virg Bernero, offers an inspiring defense of the UAW, auto workers and the blue collars middle class. I was among several local economists who authored a piece on the recession and state budget deficit featured in the Milwaukee Journal Crossroads section today. It is linked. Barbara Miner, a frequent Crossroads' contributor and award winning MATC photography grad, also has a very thoughtful piece on the importance of preserving Lake Michigan and Waukesha's drive to to use the water. 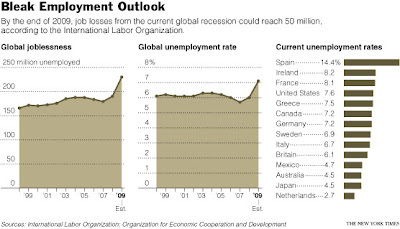 The New York times reports that unemployment is soaring worldwide. High unemployment rates have already led to protests in Latvia, Chile, Greece, Bulgaria and Finland and strikes in Britain and France. The United States Director of Intelligence, Dennis C. Blair, informed Congress that the instability caused by the global recession has become the nation's biggest security threat, outpacing terrorism. Yet, none of the House Republicans and only three Republican Senators voted for the $787 billion stimulus package designed to stop or at least slow the job loss and stimulate economic growth. And the price of those votes was reducing the size of the package and cutting needed aid to the states and to public schools, two-year colleges and universities. It's hard to take the Republicans' new found fiscal conservatism seriously since the 2001 tax cuts they enacted cost $1.3 trillion and the preemptive war they unanimously supported is projected to cost $3 trillion, significantly more the stimulus package. In 2003 anyone who opposed the invasion of Iraq was accused of being unpatriotic. What does this say about those who voted against the stimulus package now that the greatest threat to U.S. security is rising unemployment? The Times has an excellent article on the impact of GM's plant closing in Janesville. 2500 autoworkers have lost their jobs and another 1500 have been furloughed as supplier firms close. Many of these workers are enrolling at Blackhawk Technical College whose enrollment has increased by 33%. The college has responded by adding more basic skills courses and instructors, providing extra classes at night and on weekends, hiring a limited-term mental health counselor, borrowing staff from other colleges — and, in so many cases, just digging in and working extra hours. It even had to rent additional class room space and build a new parking lot. Wisconsin's 16 technical colleges are emerging as the state's safety net for the growing army of dislocated workers. As the recession intensifies and layoffs escalate, technical colleges will be under increasing financial pressure to respond to the needs of the state's unemployed workers. State policy makers need to recognize this surge in demand in the next budget by increasing their investment in the Wisconsin Technical College system. For more than three decades free market fundamentalists have criticised labor market regulations as an impediment to global competition and free markets. They have worked to undermine the social contract that helped rescue the United States from the Great Depression, win World War II and create stable growth and the world's first blue-collar middle class. Developed countries like France, Germany and Sweden with significantly stronger labor laws and generous social safety nets than the U.S. have been lectured on the need to develop more flexible and nibble labor forces. The result: a decline in full time permanent employment, the rise of a subclass of contingent workers who receive lower pay and fewer benefits than full-time permanent employees, and growing social inequality. Now that the U. S, economic downturn has dragged the world economy into a recession, millions of unemployed workers are experiencing the dark side of deregulation and labor market flexibility-unemployment and homelessness. Under Japan's traditional company centered social welfare system, firms were expected to look after employees until retirement and beyond, providing pensions and other benefits and keeping unemployment down by not laying off workers. The neo-liberal model has undermined the traditional guarantee of life-time employment for so-called salarymen and tens of thousands of factory workers laboring in the country's small factories. They have been replaced by a contingent labor force, a subclass of Japanese workers, employed by staffing agencies or hired on short term contracts with lower wages and fewer benefits. These workers are not covered by legal protections against layoffs like regular full-time employees are. Contingent workers now comprise over a third (34.5%) of the Japanese labor force. It is these workers, second class employees really, who are literally being thrown into the streets in response to the world's economic slowdown. One hundred and twenty-five thousand (125,000) of the 131,000 Japanese workers who have been furloughed since October were nonregular, contingent workers according to the Japanese Labor Ministry. According to the New York Times, these workers"...can expect little in the way of unemployment or welfare benefits." Japan simply does not have an adequate social safety net. Fully half of Japan's labor force is not even qualified for jobless benefits which were designed with lifetime employees, not contingent workers, in mind. This is the dark side of deregulation-thousands of hard working people being literally throw into the streets as if they are used up machinery. Next time you hear business leaders or economists promote labor market flexibility, ask them: how has flexibility helped Japan's new class of unemployed and homeless workers? The Senate's "compromise" on the federal stimulus plan is a betrayal of the nation's commitment to its people and the well-being of our economy. The deal slashes job creating investments in the nation's economy by $140 billion. But it leaves in tact between $300 and $350 billion in ineffective tax cuts. This means that the Senate's "compromise" plan will generate between 1 million and 2.5 million fewer jobs than the House's original proposal. It will delay the renovation and modernization, including technology upgrades and energy efficiency improvements, of the nation's deteriorating public schools, colleges and universities. It cuts funds for Wisconsin's technical colleges whose current capacities are strained by the large number of dislocated workers and veterans who are enrolling for retraining. It shortchanges special education students by failing to fund their educations. It will deprive millions of already struggling American families of health care and nutrition. The nation has lost 3.6 million jobs since the recession began. A record number of American are now collecting unemployment compensation. We should not allow the very supply side ideologues whose economic polices created this recession, the most severe since the Great depression, to play politics with the nation's economy and the health and well-being of its people. Congress should restore the $40 billion federal investment in reeling state governments that the Senate cut. If it does not, and state and local governments are forced to slash their budgets to balance them, the recession will turn into a full fledged depression as government employees, teachers and health care providers get laid off. If the $40 billion reduction is not restored, other states will follow California which is furloughing 200,000 state employees for two days a month. Such cuts will only exacerbate the recession, increasing unemployment and reducing wages and consumption. Under these conditions even well-designed business tax cuts have little impact because firms do not invest when no one if buying their goods or services. Congress should also restore the $19.5 billion investment in higher and public education that the Senate cut. If it does not, other colleges and universities will be be forced to layoff personnel like Louisiana State University which is planning to furlough 2,000 employees, eliminate dozens of courses and shut down research programs. This isn't a compromise. It is a recipe for disaster. Let's be clear: We can't expect relief from the tired old theories that, in eight short years, doubled the national debt, threw our economy into a tailspin, and led us into this mess in the first place. We can't rely on a losing formula that offers only tax cuts as the answer to all our problems while ignoring our fundamental economic challenges – the crushing cost of health care or the inadequate state of so many schools; our addiction to foreign oil or our crumbling roads, bridges, and levees. Congress should follow the President's lead -- this is a time to be bold, not cautious. This is a time to invest in America's people and future. This is the time to do something that works, not cave in to the failed ideas of the past. If you want the economics behind this assessment read Krugman's entire op ed. Obama demands action on jobs! Because each day we wait to begin the work of turning our economy around, more people lose their jobs, their savings and their homes. And if nothing is done, this recession might linger for years. Our economy will lose 5 million more jobs. Unemployment will approach double digits. Our nation will sink deeper into a crisis that, at some point, we may not be able to reverse. This plan is more than a prescription for short-term spending -- it's a strategy for America's long-term growth and opportunity in areas such as renewable energy, health care and education. And it's a strategy that will be implemented with unprecedented transparency and accountability, so Americans know where their tax dollars are going and how they are being spent. The group “Advocates for Student Achievement” (ASA) admitted at its Monday breakfast meeting co-sponsored by the Milwaukee Metropolitan Chamber of Commerce (MMAC) that it was behind a recent “push poll” in Milwaukee School Board districts with contested elections. ASA spokesman, Anne Curley, asserted that ASA had not asked any question aimed at discrediting school board members. She said those questions were from the ASA political action committee. But she acknowledged in a question from the audience that all of the questions were in the very same poll undermining its claim to scientific objectivity. Curley also said that ASA was releasing only some of the questions and responses in the poll. The Parker Group conducted the push poll, a technique used to plant negative ideas about candidates in voters’ minds while posing as a neutral poll. Spokesperson for ASA also admitted in answers to questions from the audience, that it asked no questions in the poll about the state funding formula’s impact on MPS education. While ASA claims its poll was intended to identify public perception of issues in MPS, it was clearly intended to persuade voters that the current school board is the problem and to promote the election of ASA supported candidates. The group’s agenda is clearly revealed because it did not ask about the flawed state funding formula, the costly and unaccountable Voucher Program, the failed Neighborhood School Initiative, or even what voters like about the MPS. None of the results of this poll can be taken seriously if some of the questions were “push” questions. Milwaukee School Board President, Peter Blewett, condemned the push poll two weeks ago when constituents contacted him about it. “These push polls are classic sleazy campaign tricks,” Blewett stated. “I have never used them. I want a campaign that focuses on how MPS can prepare our students for challenging world of work or higher education. Voters have a right to hear about how candidates plan to improve MPS. Secretly-funded sleaze campaigns debase the democratic process and insult voters’ intelligence,” Blewett added. If ASA really believed in transparency, it would release all the the questions in the poll so public can see that the poll was designed to get the answers it received. An additional issue at the event that was held at the Italian Community Center was that the group allowed three candidates for the Milwaukee School Board to speak, but did not allow candidate, Larry Miller, to address the audience. Leo Gerard, President of the United Steelworkers of America, warns that the federal stimulus package passed by the House of Representatives could be undermined if the U.S. Chamber of Commerce and large multi-national corporations get their way. The $800 plus billion stimulus is designed to pull the United States out of a deep recession that has caused over 2.55 million layoffs. A record number of Americans are now receiving unemployment compensation. As Businessweek reported in its cover story a few weeks ago, taxpayers will lose a major bang for their buck if their stimulus money is spent on products and commodities made overseas. Thus, the House of Representatives included language in the stimulus bill aimed at ensuring that when the stimulus money is spent, it will create jobs at home. ...15 business groups sent a letter to Congress opposing provisions added to the recovery package that would strengthen existing laws requiring government agencies buy American steel and other products when building public works projects with tax dollars. The package is, essentially, Americans agreeing to increase their national debt to revive an economy sucker punched by greedy Wall Street gamblers. So when business interests want to spend those tax dollars overseas, to create jobs there at the expense of unemployed Americans, while at the same time increasing the U.S. trade deficit, frankly, it looks a bit like treason. To survive this economic catastrophe, Americans must assert themselves as economic patriots. They must stand up to the likes of the Chamber and the Roundtable and call them out for being economic traitors to the United States of America. Next week the U.S. Senate will debate and pass its version of the stimulus. 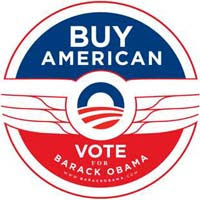 They should keep the Buy American provisions in the bill. The Chamber and the Emergency Committee for American Trade are spending millions on lobbyists to weaken the very provisions that steer stimulus dollars towards the purchase of American produced goods and services. They are receiving support from companies like Caterpillar and General Electric (not surprisingly, two of the biggest job outsourcers) as well as the usual cast of Washington's corporate-funded think tanks and private equity firms like the Carlyle Group who make the hysterical claim that ensuring American tax dollars are spent in America will somehow initiate a global "trade war." The groups and companies lobbying against the Buy American provisions in the stimulus package are trying to defend a business model that relies on economic policies that effectively incentivize corporations to ship jobs overseas, where they can avoid unions, exploit labor, and destroy the environment. Buy American laws that reward domestic businesses for staying in this country are a threat to the multinational corporate lobby. The Chamber and its allies have no loyalty to this country or its working people. Their sole commitment is to the bottom line. Gerard's entire article is linked.